Too many of my favourite tattoo artists live on different continents. Cate Webb is one of them, so when she announced she was visiting London I panic-typed an email in the off-chance there was room in her schedule for a photo shoot and interview. Cate made time for both. It was tough work editing down the 17-page transcript of our conversation because Cate is full of colourful stories, thoughtful observations and spot on metaphors - I wanted to share it all with you. Enjoy! I wish I had more time with a tattoo artist so that I didn’t just arrive and see the design for the first time. I understand that’s a logistical nightmare for an artist. I wondered, do you like spending time with a client? I do all my consultations through email which can be hindersome sometimes, but I do have a lot of experience with customer service. For the most part, I make some really amazing connections with people because you’re so vulnerable when you’re being tattooed. It’s like you’re driving this car on this icy road and everyone in the car’s life is in your hands. It’s kind of a gamble every time. I’ve been doing it for years but I’m still surprised at how some people’s skin reacts to ink. Some people have really tough skin, some people have soft skin. Some people immediately go into the heaviest things. They tell me their darkest stories. Maybe I’ll never see them again, but for that moment while I tattoo them, we are like sisters, we’re family. It’s how I talk about the difference between machine tattooing and hand poking. Machine tattooing is all about status and power, and hand poking is about community and connection. Because a lot of women do hand poking. Why do you get tattoos? There’s many reasons. One is because it’s like a visual history. Every time I get a tattoo I feel stronger and more confident because they are like my totems. They are there and they keep me safe. Hand poking is so methodical and rhythmic. It’s like you’re sewing into people’s skin and the images are very simple. The design is very organic. What are some of the things that people have said to you about your tattoos? The weirdest thing that anyone said about my tattoo was this girl who when I was working in a coffee shop once said: ‘I really like your tattoos. Did you hear about that man who can read tattoos?’ And I was like ‘What do you mean read tattoos?’ She said, ‘He can touch your tattoos and tell you what it means. He offers an online course’ and I was like, ‘Are you taking the online course?’ and she was like, ‘Yeah I am!’ and then I was just like, ‘Do you wanna read one of my tattoos?’ She grabbed my arm and I felt like I was down in the Bible belt. She was like, ‘Oh sweet Jesus, let the power of Christ run through me.’ And my co-worker is standing behind me just like ‘What is going on?’ and she’s having this full-on spiritual experience, telling me that there’s a woman standing on a roof and that I’m heavily protected and I’m too protective of myself. Then she was in this kind of trancy, breathy voice and said ‘Don’t you think God likes tattoos?’, and I’m like, ‘I don’t know what God thinks about anything’. So was this a kind of segway into trying to convert you? No! She just walked away. Do you think about the ageing process just from a technical point of view? Some people are really perturbed by that but I honestly think that it’s kind of beautiful that they age with you. 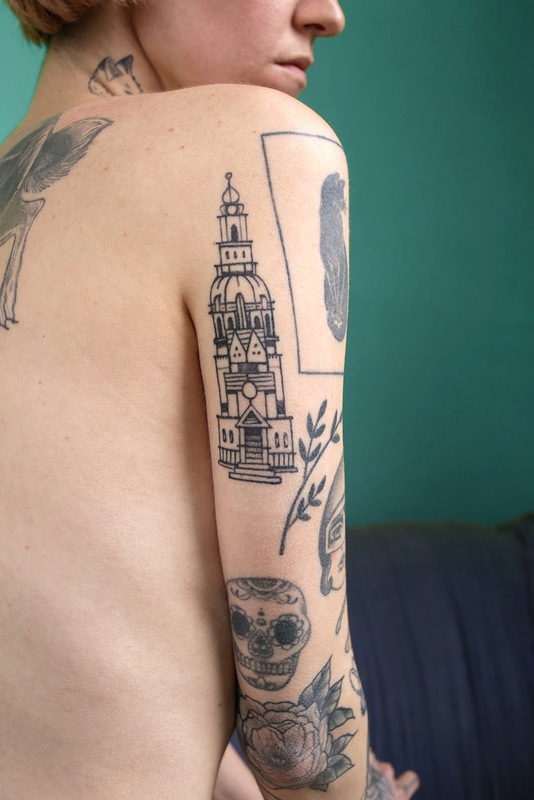 Often, for the first couple of years of getting tattooed, I would picture my dead body. It’s super morbid but I would imagine my skin when I was dead what it would look like, you know? Some people request that their skin is removed and kept. Do you think you would do that? I don’t know. I think I would prefer to be cremated and have them ‘die with me’. But the fact that they age with you and they go through time with you, I think that’s beautiful. I don’t want them to look sharp forever because I won’t look sharp forever. That’s what I tell people: ‘When I’m old, I’ll look old and they’ll look old with me and we’ll match’. What role does pain play in getting tattooed? You can’t rationalise emotional pain, but you can rationalise physical pain. It’s interesting because most of my clients are women. The few male clients that I do have are the biggest wusses. Men have such a low pain tolerance. I think it’s because women every single month go through pain, we bleed, we know suffering better than anybody. You said you feel protected by your tattoos. What do you mean by that? So if you think of vines on a veranda, they curve and the shadows that they would create if the sun came down, that’s sort of like how the tattoos feel on your body. 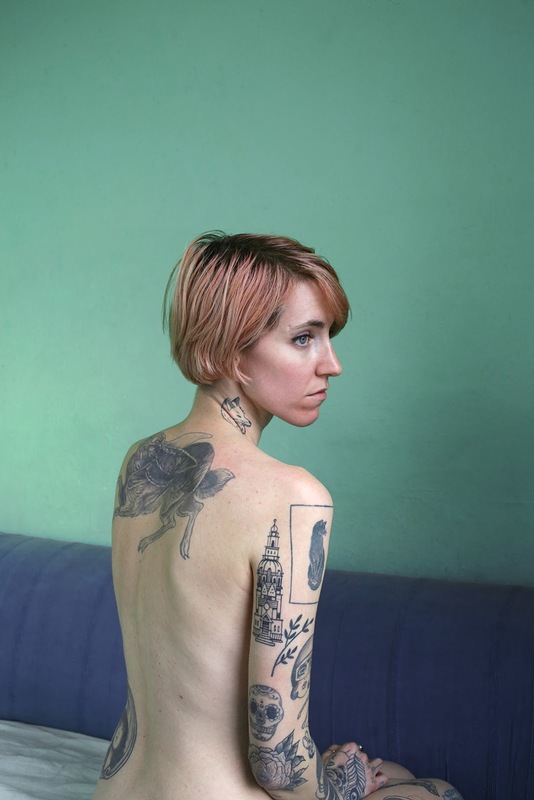 When you have bare skin, you’re completely exposed to the world, but when you have tattoos, you’re still naked, it’s still your skin, but they give just that little extra barrier between you and the rest of the world. And I think that’s why I feel protected. It’s like they’re my buddies, they’re keeping me safe, they’re not exposing all of me. In 10 years we will see much more official people with visible tattoos. I think people are starting to realise that it’s not about what they mean, but how they feel. Like feeling protected, feeling safe, especially for women. I still have men say to me, ‘Women shouldn’t have tattoos’ and it’s because of femininity and these ideas around that. I love seeing women who are heavily tattooed. 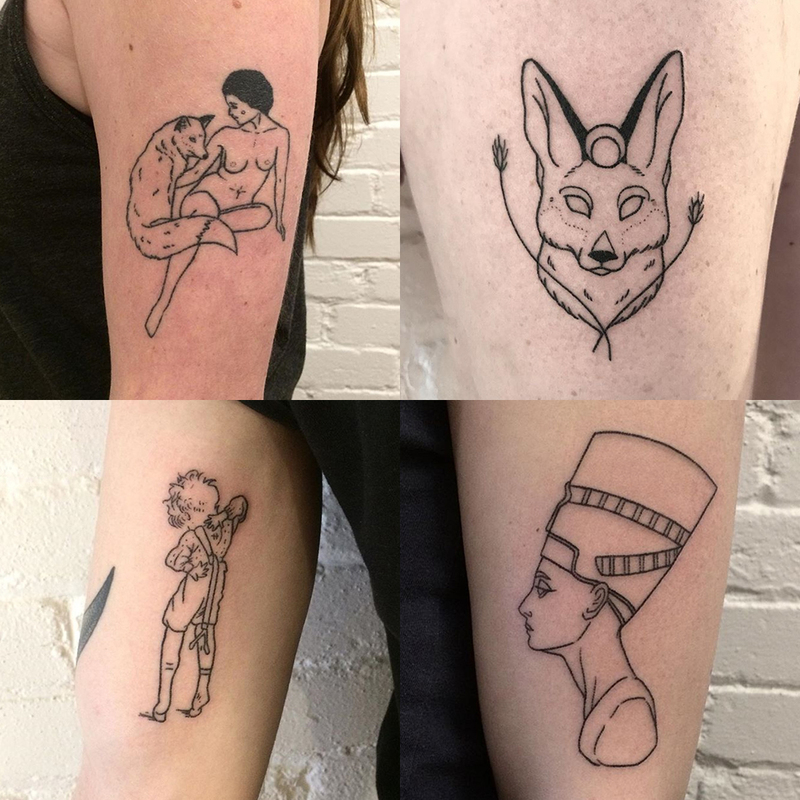 I think it’s so cool that women are getting more and more tattoos and there’s more and more women tattoo artists popping up and they’re very well respected. We’re changing the game.